Ensuring technology meets the needs of the business is IT's first priority. However, certain challenges can prevent them from acomplishing this goal —a large backlog of IT requirements for fixes, enhancements and new development. With a small staff and increasing demands on its time, IT struggles to prioritize business-driven requests and keep applications evolving. The Application Services team at Fresche has helped many companies overcome their backlog and keep up to date with business needs. 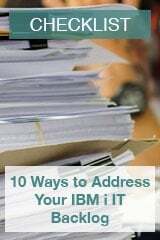 We asked our experts to put together a list of ten strategies companies should consider to address their IT backlog and evolve their IBM i systems. Complete the form to download the checklist!